This art package contains western art that can make you money! 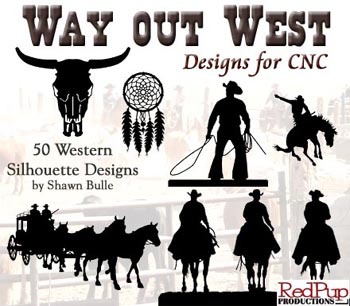 Way out West designs for CNC is a collection of silhouette patterns that contain new designs, as well as some popular designs that have been requested by our customers over the years. Our customers use the patterns to create coat racks, lamps, signs, ranch entries, grave markers, napkin holders, cowboy and cowgirl bathroom door signs, key racks, wind chimes, wall hangings, coffee tables, railings, gates, hanging pot and pan racks, light switch plates, mailbox decorations, truck racks, trophies, paper towel holders, etc.